In a pinch, a convection microwave may be a viable substitute for an oven in a smaller kitchen. Microwaves come in two types: conventional and convection. Conventional microwaves work by converting electricity into microwaves, which then heat the water particles in food. Microwave ovens heat food quickly and efficiently, because only the food is actually heated. Convection microwaves work in a similar way to conventional microwaves, although with a somewhat different effect. The difference is that convection microwaves use a fan to circulate air around the food. You can do much more with this type of oven, including browning, crisping and baking. These properties in particular give convection microwaves a huge edge over conventional microwaves (as anyone who's ever pulled a miserable, soggy slice of pizza out of a conventional microwave can tell you). In fact, at a pinch a good-sized convection microwave can be used as an alternative to a regular oven. Convection ovens normally offer the option of cooking in conventional mode too. Microwave powers are normally measured in wattages. The most common wattages for consumer model microwaves lie between 800W and 1500W - commercial microwaves are also available, which can go well beyond 2000W (although this is overkill for most residential kitchens). The volume of the microwave you need will depend on what you're likely to be cooking, and how big your family is. How powerful your microwave is will usually be directly related to how big it is. 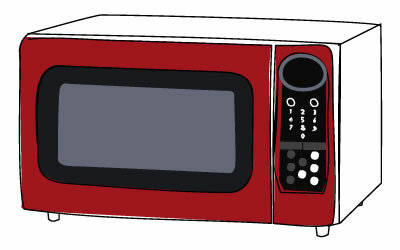 A small microwave will generally hold about 20 litres, while a large microwave can hold up to 44 litres. As you'd expect, prices vary fairly predictably with size, power and overall build quality. Even the most basic microwaves these days offers a range of different pre-programmed power levels, to allow you to defrost meat without cooking it or to heat food. Some also have one-touch buttons based on scenarios involving what you're putting in and how much of it you're heating. These options can be very useful. Other technologies include scales that automatically assess the volume of food you've put in, and intelligent cooking cycles to ensure that food's cooked all the way through. A caveat about functions and features: good features can be an absolute treat, but if you don't fully understand them, you'll never use them. Make sure you buy a microwave you can understand! Many microwaves will just sit on a bench; however if you're planning your kitchen from scratch there's a good chance that you're hoping to mount it on a wall or inside a cabinet. If you are planning to build your microwave into a cabinet, you need to ensure that there's enough ventilation. Most microwaves will require an absolute minimum of 50mm clearance around the sides, but this will vary significatly depending on the model and manufacturer. Check your kitchen's measurements against the microwave's ventilation clearance requirements before you commit. When considering your microwave, ask the retailer whether it includes a non-stick interior, grease filters and a removable turntable. If you want to splurge, you can buy models with self cleaning liners that prevent food and grease build-up. To stop your plates or containers melting and leaving a big mess, use only microwave-safe plastics, glass and ceramics. Never put metal in a microwave, as metal reflects the microwaves and will create fireworks.